The Women’s Earth and Climate Caucus is now glad to offer a series of seminars and trainings in building Resilient Community. Along with the initiatives and programs we have developed nationally and internationally, there have been many requests to generate more hands-on participation. Transition US is proud to be hosting these three virtual conversations prior to in-person courses to be held in Corte Madera, CA. "The Permaculture Movement Grows From Underground"
Featuring: experiential workshops addressing sustainable food, community and how to create the changes we wish to see. Will Allen of Growing Power will be the keynote speaker. Listen to speakers such as David Suzuki and Vandana Shiva, hear presentations from small food enterprises and attend breakout sessions relating to the soil, our food system and the economy, plus meet members of the 11 chapters flowing millions of dollars of investment into small food enterprises. Explore the forefront of positive change in deeply inspiring keynote talks, panels, workshops and intensives. Connect with leading-edge people and ideas. Network with dynamic changemakers. Experience Moving Image Festival screenings, and networking receptions. Discover powerful opportunities and strategies for creating positive change in your work, life and community. Join us for a second insightful conversation with Rob Hopkins, author, Permaculturist and founder of the Transition Towns Movement. In this conversation we will be asking Rob to go more deeply into the "Ingredients of Transition" as well as answering questions supplied by participants. Transition US board member, author and visionary Vicki Robin will be the host for this call. Transition US is partnering up with the No Impact Project and we encourage you to challenge yourself to the No Impact Experiment: a one-week carbon cleanse. It is a chance for you to see what a difference no-impact living can have on your quality of life. It’s not about giving up creature comforts but an opportunity for you to test whether the modern “conveniences” you take for granted are actually making you happier or just eating away at your time and money. Joining is simple! Click here to register for the next program in collaboration with Yes! Magazine (beginning Sept 18th). Or, if you are a student participating in yourUniversity’s No Impact Week, register here. Visit How It Works for step-by-step instructions and register to download our How-To Manual for day-by-day guidelines. Watch inspiring videos from past participants about their lessons from the week and what motivated them to try it. Transition US is excited to be teaming up with 350.org on this important day of action. Please check out the Moving Planet website to find an event near you, or create a new one. It couldn't be easier and at the same time more important! Moving Planet is a worldwide rally to demand solutions to the climate crisis—a single day to move away from fossil fuels. For too long, our leaders have denied and delayed, compromised and caved. That era must come to an end. Come on bike, on skates, on a board, or on foot. Come with your neighbors and your friends, your family and your co-workers. Come be part of something huge. It's time to get moving on the climate crisis. Jan Spencer of Suburban Permaculture has put together a series of posters to that show and tell real life examples of making big changes. The posters come laminated and can be used for Permaculture classes, conferences, neighborhood meetings, show and tell, or a fundraiser for your group. to peak oil and climate change. The rest, as they say, is history. 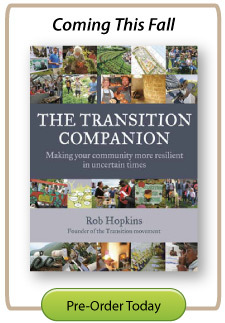 Rob’s eagerly awaited new book, The Transition Companion, picks up the story three years later, drawing from the experience of Transition communities throughout the UK and the world. The Companion is a deliberate move away from the “12-Step” approach utilized by the Handbook--toward a more holistic, appropriate model. We’ll have more information on how to order the Companion in next month’s newsletter. Contact us regarding bulk orders. We've been real busy here at PCI in August. Have you caught our latest animation yet — Who Killed Economic Growth? yet. Perfect for explaining our current predicament to friends, family in colleagues, we hope you'll love it. We're not stopping there though in helping you get the message out. Richard Heinberg has written a fantastic script that presents our oil journey in a truly accessible way, and we're now looking to turn this into something really user friendly and inspiring to present. To do this we're raising funds, not only to create the slideshow but to train volunteers so that they can deliver it in their own communities. Find our more here about the project here. Thanks for your support.